Edworthy Park, with its Douglas Fir Trail, is one of Calgary’s best kept secrets. 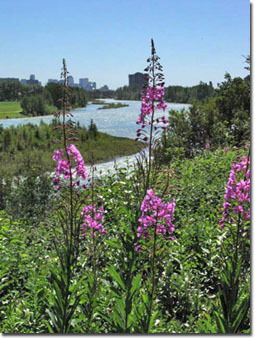 It borders the west side of the inner city and comprises 70 acres of pristine, natural parkland. It’s a gem that you don’t want to miss. Historically, various areas of it were used as a bison kill site, tipi camp, commercial garden, brick factory, and sandstone quarry. An eight minute drive from downtown Calgary will get you to the entrance of the park, about 12 km, or 7.5 miles, from town. If you’re an avid biker or rollerblader, you can be there in 20 minutes. Or if walking is your preference, it will take you about 45 minutes. The pathway runs along the Bow River, which is ranked one of the top two trout fishing streams in North America. While enjoying the exercise and clean mountain air along the trail, you may well be treated to the sights of osprey diving for fish, beavers gnawing away on the riverside poplars, or white pelicans nesting on one of the small islands that dot the river. You will get your fill of Canada geese and ducks and you may even be lucky enough to spot some white-tailed deer and the odd coyote. The park’s hiking and biking trails meander through coulees full of wildflowers, gentle hills, and bluffs adorned with grassland and shrubs native to the prairies. As a bonus, you can hike through the cool shade of the Douglas Fir Trail. Thick with 400-year-old trees that tower high above the river valley, it is the most easterly stand of Douglas fir in Canada. So bring your camera, sunscreen, and a good pair of walking shoes, and enjoy a bit of nature in the heart of Calgary. You can find more information about Edworthy Park, plus a map of the trails, here.